A pair of hikers make their way to the Hanging Lake trailhead on a chilly winter afternoon Thursday in Glenwood Canyon. A new fee-based hiking permit and shuttle system to allow a controlled number of people in and out of the popular Hanging Lake area in Glenwood Canyon starting in May is intended to improve the visitor experience, according to Forest Service and city of Glenwood Springs officials. “It will be a vastly better experience than what people are seeing up there today,” Aaron Mayville, Eagle-Holy Cross District ranger for the White River National Forest, said during a Friday telephone conference with reporters to talk about the new management plan and shuttle system. “What you’re getting now with that visitor experience is crowding,” in the parking lot, on the trail and at the delicate lake feature high up on the canyon’s north rim, he said. “What this new system gets us is less crowding on the trail, and just a much more pleasant experience,” Mayville said. 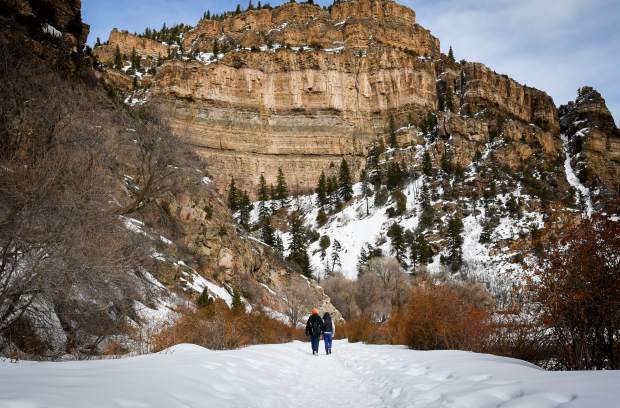 The Forest Service and city of Glenwood Springs announced formal plans Thursday for the city, in contract with Glenwood-based H2O Ventures, to operate a reservation system and shuttle services to and from the Hanging Lake Trail area. A $12 fee per person will cover the hiking permit and transportation. Under the plan, 5 percent of overall revenue is to go back toward the partnership, including system improvements and to maintain on-site operations of Hanging Lake. “The cost of the reservation includes guaranteed free parking and access to the Hanging Lake Welcome Center, the ease of an online reservation system, shuttle service to and from Hanging Lake, and ranger presence to provide visitors with environmental education and interpretation,” according to a press release. The shuttle and permit system culminates a six-year planning effort to address overcrowding and overuse issues at Hanging Lake, including violation of rules such as no dogs on the trail and at the lake, no swimming and no walking out onto the fallen log that lies across part of the lake. The new permit-based shuttle service will limit the number of visitors at the popular destination to 615 per day. It will run from May 1 through Oct. 31, and the Hanging Lake parking lot will be closed to personal vehicles during those six months. During the off season, from November through April, visitors can park on site but will still need to book a $10 permit through the reservation system to hike the trail. “I think this will be a wonderful way to protect the treasure that is Hanging Lake,” Lisa Langer, vice president of tourism marketing for the Glenwood Springs Chamber Resort Association, said. She noted that it was after Hanging Lake received a national Natural Landmark designation in 2011 that the numbers of daily and annual visitors started to increase. The area now sees upwards of 1,000 to 1,200 visitors per day during the peak summer season. Annual visitation has grown from 90,000 in 2013 to 186,000 in 2018, according to Mayville. He said the visitor cap of 615 people per day that was established as part of the U.S. Forest Service’s new Hanging Lake area management plan is also flexible over time. It could be adjusted, either up or down, based on conditions and system needs, which will require regular monitoring, he said. During the shoulder months of April and November, if the Forest Service sees that the parking lot is still filling up on a regular basis, it’s possible the shuttle requirement could be extended to those months, Mayville also said. The $12 fee was arrived at through a competitive bidding process through the city, said Glenwood Springs City Manager Debra Figueroa. That “better experience” for those who visit Hanging Lake does come with a cost, she said. H20 Ventures is taking a “not insignificant risk,” Figueroa said, in signing on to set up the planned Hanging Lake Welcome Center next to the Glenwood Springs Community Center, operate the reservation system and run the regular shuttle back and forth to the trailhead.